This piece was published in The Big Issue in October 2010. In Delhi the poor can’t be avoided, even from the air-conditioned comfort of a taxi cab or train carriage. The athletes and delegates arriving in the weeks before the Commonwealth Games would have seen labourers’ shacks outside the airport, the children ferrying bricks around, the women on their knees painting black and yellow strips on the VIP lane of the motorway. Some of India’s own competitors traveled to the capital by train, passing the many slums littered alongside the railway line. Slums such as Mayapuri: a hellish arrangement of brick huts, corrugated roofs and walkways of oily mud, all squeezed in between the train track and noisy motorbike scrap yards. The 52-year-old is looking after her latest grandchild (below), one of three. She and her friends proudly show off their health charts and first aid kits, having been trained by Delhi-based charity Asha to administer medicine and assist pregnant women in safe deliveries. 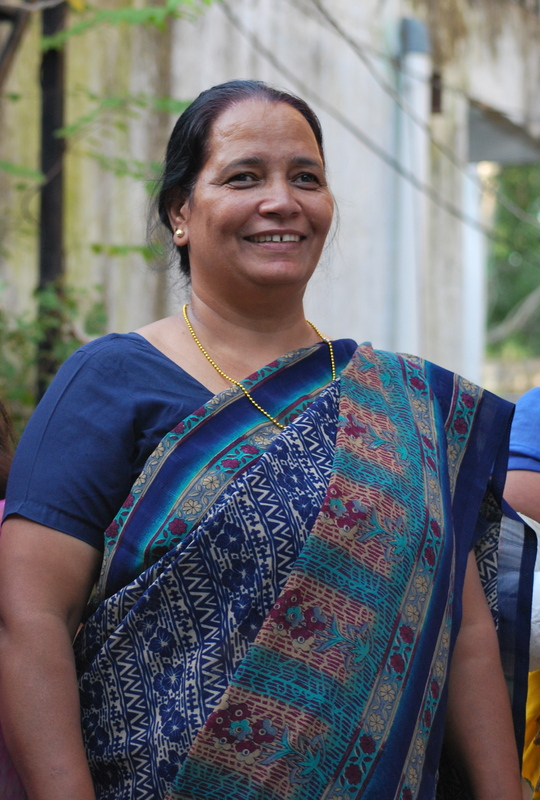 Asha has also helped some of Mayapuri’s slum dwellers open bank accounts and take out small loans. Lofty visions of global pre-eminence continue to hold the nation spellbound. Preparations for the Games were geared toward confirming Delhi’s arrival as a “world-class city”: a 21st century mantra endlessly incanted by politicians in the hope of dispelling, once and for all, the western idea of India as an exotic basket-case. The country’s media carried images of filthy basins and stories of snakes terrorising African delegates, but the embarrassment caused by a less-than-perfect athletes’ village has been brushed aside. Within minutes of the dazzling opening ceremony getting under way, one TV station began running the headline: World Showers Praise on Delhi. Slogans like Our Games Our Pride and Go India Go are flashed with news of each medal victory. More searching analysis has been left to a handful of charities and intellectuals, appalled that a chance to transform the living conditions of millions has been wasted. 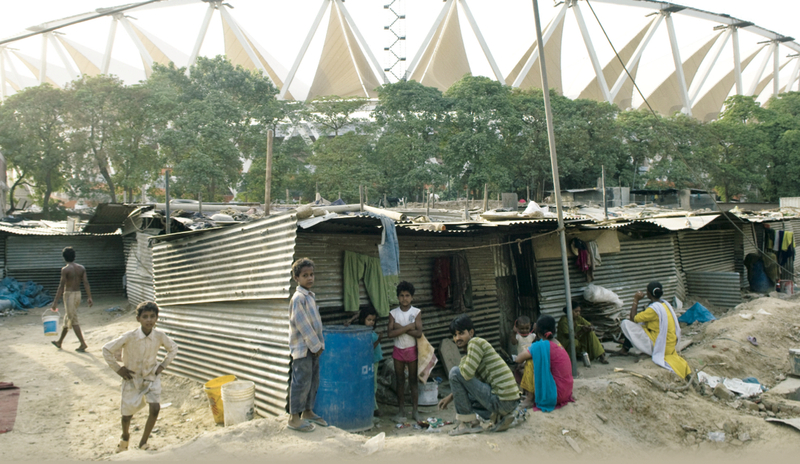 Research by the Housing and Land Rights Network (HLRN) shows almost £100m have been diverted from poverty reduction projects for Delhi’s three million slum dwellers toward extra funding for building stadia. Best estimates suggest somewhere between 100,000 and 200,000 families have had their homes destroyed in connection with the Games. “There is a quiet kind of exodus of the poor from the centre of the city, and it’s very disturbing,” says HLRN campaigner Shivani Chaudrey. More than $2bn has been spent on trying to create “world-class” facilities and infrastructure – stadiums, roads and shopping malls. Some developers have made money, but the wave of new tourists has not emerged. Much of Delhi still resembles a dirty, bashed-up construction site. Last year, the Prabhu market slum in the centre of the city was cleared to make way for a parking lot that remains incomplete. According to Dunu Roy, a veteran critic of Delhi’s planning authorities, slum clearances have been happening in Delhi for several decades, intensifying since work on the Games began. “They may say slums are illegal use of public land, but the real illegality is the failure of the state to provide the public housing required,” he says. “This is fantasised planning. They don’t actually realise who lives in their city. But it appeals to the imagination of the middle class – this idea of being a world power. The resettlement colony of Savda Ghevra appears shortly after the screeching chaos of Delhi subsides and the city finally opens out into fields of tall grass. Out here on the periphery, 6,000 slum dwellers evicted from the banks of the Yamuna river – prime land near the site of the athletes’ village – have created a passable imitation of urban life. Red brick houses sit in straight lines, dressed in the bright colours of drying clothes. A huge Vodafone sign hangs over a mobile phone shop while flies pick away at a dead dog outside. This place did not exist five years ago, yet the main thoroughfare is crammed with tea stalls, bus stops, ice-cream vans and chicken coops. Rajwati Singh (left) shows me her neat little red brick home, complete with second-floor kitchen. Rajwati’s teenage son proudly flicks through scores of channels on his television and settles on an Indian version of Ready, Steady, Cook. Rajwati recalls the summer of 2006, when they were bused out to Savda Ghevra, left only with an empty plot and INR7000 (around £100). There are now two schools on the edge of Savda Ghevra, and the community has pressured the authorities to build a proper sewage system and pick up their garbage every other day. Others have not been so fortunate. Some colonies have received basic facilities more slowly. Those who could not prove a lengthy enough history of residence in a particular slum were not granted any resettlement rights or financial support. HLRN believe only one-third of cleared families have been rehoused. Guatam Bhan, author of Swept off the Map, a book detailing the fate of the jhuggi-dwellers cleared from the banks of the Yamuna, is less fatalistic. “The poor are completely used to being told to get lost and completely used to finding ways around the latest orders,” he explains. “We too easily dismiss the poor. They are smart, strategic citizens. If you stick around long enough, if you make it through those first few years without anyone trying to get you off the land, if you slowly get water connections, an electricity meter, a voting card, you build a paper record of your existence – you will be entitled to some support and protection. If the city has always been in perpetual motion, families are rising or falling more rapidly than ever before. Material aspiration in India is intense, and the old concepts of caste and the karmic wheel hold far less sway than the wealth and comfort up for grabs in this particular lifetime. There is always someone just above or below. If you only share a tarpaulin-and-brick hut with your in-laws, you’re doing better than the guy sleeping in the empty concrete pipes by the side of the road. If you aren’t making much of a living as a rickshaw-puller, you might soon hope for the chance to drive a three-wheel auto rickshaw. So many rungs on the ladder can make poverty hard to define, but Delhiites know when they have escaped it. Twenty-five years ago, Shanti Vihar was a rubbish dump on the edge of a public park. 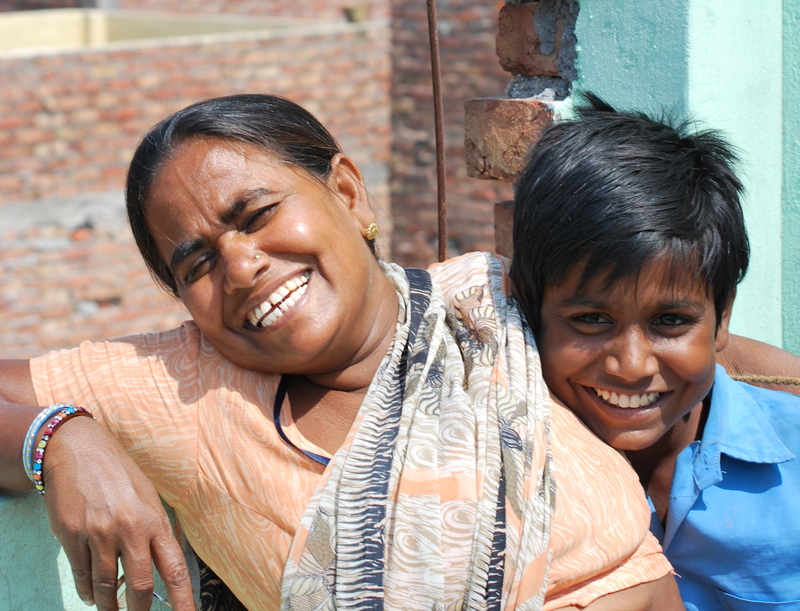 Today the place has the winding cobbled streets of a Mediterranean village, after assistance from charity Asha allowed slum families from the countryside of Rajasthan and Madhya Pradesh to develop their own homes without fear of removal. 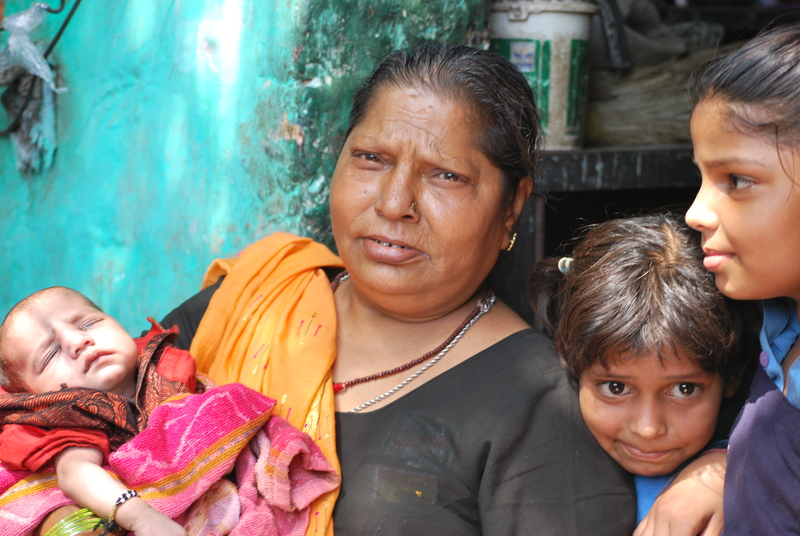 Usha Joshi (left), 53, lives here with her son and daughter-in-law and sells toffee outside the local school. She and her friends politely pass round cups of tea and biscuits, listing prized possessions unimaginable even a decade ago: microwaves; fridges; washing machines. “This used to be a shack,” Usha says. “We would sit in the mud, picking through the rubbish. Before we were low class, very poor. Now we are in the middle class. We are no less than them. However much money has been misdirected, however many budding Shanti Vihars have been disrupted, the city’s rhythms will return when the athletes have gone home. As India’s urban middle class swells, so do the ranks of the rural poor who arrive in town each day in search of a life glimpsed on TV and cinema screens. The ebb and flow will continue, and Delhi will carry on dreaming; a city forever cobbling together castles in the air.